I worship yAmunAchAryar by whose mercy my defects have been removed and I have become an identifiable object, i.e., previously I was like asath (matter) and now I have realized that I am sath (soul) after meditating upon the lotus feet of yAmunAchAryar. The Lord of SrI mahAlakshmi1; Whose essential nature is being the sole Reservoir of all illustrious Attributes, the Antithesis to all evil (hEya),–(such Attributes) as Wisdom (gyAna), and Bliss (Anandh);–Who is the great Ocean of the legions of the boundless, exalted and countless glorious qualities, behoving His (essential) nature, such as Omniscience (gyAna), Strength (bala), Sovereignty (aisvarya), Constancy (vIrya), Power (sakti), and Lustre (thEjas); Whose Divine Form is a mine of effulgence, beauty, comeliness, (eternal) youth, and other Perfections of the Person,–beyond conception, divine, wonderful, constant, uninjurable, and superb, which are immutable and accordant with His will–; Who is adorned in transcendental Ornaments,–diverse, marvellous, countless, wonderful and permanent, worthy of Him and perfect–; Who is accoutred in illustrious divine Weapons, agreeing with His nature,–innumerable, of inconceivable power, eternal, beyond injury and beyond praise–; Who is the beloved of SrI mahAlakshmi,–SrI, Who is perfect in all the multitude of limitless, marvelous and innumerable qualities such as amiability (seela) etc.,– harmonizing and coordinating with Him in nature, form, state (regal = vibhava), and plenitude or empire (aisvarya)–; Who has at His feet, ever singing hymns, countless Illuminated Angels, whose essence, being, and wonderful works are in accordance with His will;–their delight solely consisting in rendering all service to Him, possessed as they are of a multitude of vast, eternal, uninjurable and sublime attributes, past definition by speech or thought–; Who has His abode in the super-celestial Firmament called akshara (the imperishable),–conforming with His nature, diversified, strange, endless, and abounding in objects,–means,–and localities,–of enjoyment;–that Firmament, of infinite wonderment, infinite glory, infinite extension, ever-existent and removed from harm–; Whose will and pleasure, it is, to dramatically display the Universe in its modes of projection, sustenance, and dissolution–the Universe so replete with various and curious objects of enjoyment, and hosts of enjoyers thereof–; Who is parambrahma 2, purushOththama3, and nArAyaNa4;–He (the Lord of SrI mahAlakshmi), having made the cosmos from brahmA down to the immoveables, retired into His own Self, so that to the meditations and adorations of brahmA, the celestials (dhEvas), and the mortals, He became incognizant. But He, being the vast Ocean of infinite Mercy and Condescension, Love and Bounty, willed to assume (material) forms similar to those of His creatures, without abandoning His own essential divine (immaterial) nature, and repeatedly made descents among them as incarnations in the several spheres where the creatures dwelt. So accessible to those by whom He was worshipped, He granted their desires, to wit, any of the four-fold aspirations of man, dharma (meritorious work done here carrying with it the virtue of bringing future happiness, mundane or otherwise), arththa (riches and general prosperity), kAma (enjoyments), mOksha (deliverance or Salvation). The object of Incarnations is to relieve the earth of its burden of sin and suffering, but at the same time no less is the Lord’s intention thereof that He should be within reach of even people of our sinful description. To fulfil this purpose, He manifested himself on earth so as to be actually an Object for all men’s sights to see, and performed such other wonderful acts as to captivate the hearts and the eyes of all creatures high and low. For example, in the avathAram as krishNa, He destroyed evil pests to society such as pUthanA and sakata, yamaLa and arjuna, arishta, pralamba and dhEnuka, KALiya, kEsi and kuvalayApIda, chANUra and mushtika, thOsala, kamsa et al. He delighted the worlds with His looks and language overflowing with the nectar of amity and love. Such men as akrUra and mAlAkAra became most godly (i.e., Saints) enraptured by the most agreeable Presence, the condescending deportment and numerous other qualities exhibited by Lord krishNa. 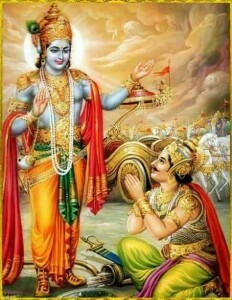 Under the pretext of having to persuade arjuna to fight, SrI krishNa promulgated the doctrine of bhakthi yOga, — led up to by gyAna and karma, — or that Path of Loving-Devotion which is the essence of all the vEdhAntha teaching, and by which He is indicated as The Only Object of Love, and that, loved, He Himself is The Means to lead man to the climax of his ambitions, viz., mOksha (salvation or final liberation from all ephemeral and conditioned existences). Thus then, when kauravas and pANdvas became belligerents, He, bhagavAn5, purushOththama and God of gods, appeared as an incarnation (krishNa), with a view to showering benefits on the world; and allowing Himself to be overpowered by love for His faithful dependents, gave Himself up to their service, and posted pArtha in his war chariot, Himself undertaking the duty of the Charioteer so as to be witnessed by the whole Universe. This entry was posted in Chapter 1, Simple on September 29, 2015 by Śrīvēnkatēśa Rāmānujaḍāsan.